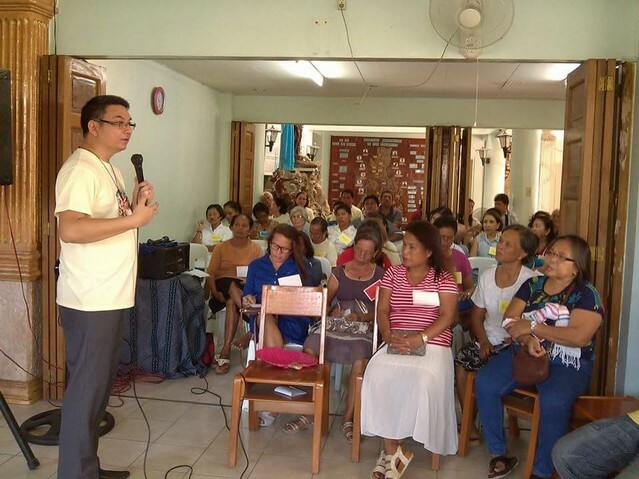 CEBU, Philippines - On August 6, 2017, the Feast of the Transfiguration of our Lord, 51 participants coming from different parts of Cebu came to the Montfort Mission House at E. Apostol Street, Lower Calajo-an, Minglanilla, Cebu to start their TOTUS TUUS JOURNEY (TTJ)- a 33 days Preparation for Total Consecration to Jesus through Mary, according to St. Louis-Marie de Montfort. The Launching of the TTJ - Batch 15 began with the celebration of the Holy Eucharist at 8 o’clock in the morning presided by Rev. Fr. Richard J. Magararu, SMM, the Delegation Superior of the Montfort Missionaries in the Philippines. Together with him, as concelebrants, were Rev. Fr. Federick B. Yumang, SMM, the Director of St. Louis-Marie de Montfort Center of Spirituality and Rev. Fr. Sherwin Y. Nuñez, SMM, the Superior of the Montfort Cebu Mission Team. The Eucharistic celebration was also attended by those who already made their consecration (from Batch 1 to 14), the Daughters of Wisdom, the regular Mass goers from the neighborhood, and the families and friends of the participants. After the mass, Fr. Fed gave the introduction and orientation of the whole process followed by the 1st session given by Fr. Richard. After the session, a sumptuous meal prepared by the TTJ Cebu was shared by everyone. Before heading home the participants expressed how much they were inspired by their experience of the first step of their Totus Tuus Journey. They are determined to continue participating in the forthcoming sessions and to be able to renew their Baptismal Promises. They are excited to consecrate themselves to Jesus though Mary so that they can wholeheartedly say “I am all yours and all that I have is yours O Jesus through Mary”. Glory to Jesus in Mary. Glory to God Alone!